Updates to Gary Andrew's profile since your last visit are highlighted in yellow. I Did 4 years in the US Air Force 1966 to 1970 = working on Ordnance & EOD duties, with two tours in Vietnam. I left Arthur Hill 5'10 & 155 - left the Air Force 6'4 & 230 - as many will recall I was an easy target for the many school bullies. I came out of the Air Force with 4 martial arts belts - and sadly to say I did hunt bullies while in the service for the fun of it. I did come to realize that this was not PC and did stop my action. In 19710 I joined the Saginaw County Sheriff Dept. - working for 20 years on the road & then another 15 years in the jail. Retiring from the Saginaw County Sheriff Dept after 35 years as Admin. Sgt. (Assist. Jail Admin), were I was in charge of 500 inmates & 120 employees. Then after one day off I became Undersheriff of Iosco County Sheriff Dept. for the next 3 years. I spend most of my time in Sand Lake area of Iosco County at our Cottage. 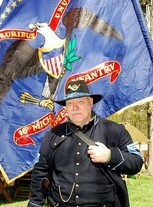 But my real Love is Living History - President of the Michigan Living History Educational Assoc. - we do 5 different time periods, 1822 (fort Saginaw) 16th Michigan (Civil War) 1918 (WWI) 1941 (WWII) and we are just about the only group to do Lectures on the Vietnam War. I have received 5 State Senate Special Tributes & Concurrent Resolutions for Lectures presented in State Schools. We present our programs to students all over the state. Past Lector for the John F. Kennedy Center for the Preforming Arts, Michigan Council for the Humanities. Saginaw County Historical Commissioner for 10 years. Author of two books on Michigan & Saginaw History. Not many I enjoy as I was the one getting his rear end kicked, by just about anyone who wanted to look tough. I did have some good friends while in school, and I did have the honor of being one of only a few, to have been on that Arthur Hill Rifle Team. Yes rifle team, we had at least 8 rifles in the basement of the school, and never once did any of us think of used them for any but shooting targets. I did not do well in grades, and this hurt me later, as I found while in the Air Force, I had a fifth grade education, and fourth grade reading ability. but I managed to bring that up over the years. Gary Andrew Van Riper has a birthday today. Gary Andrew Van Riper has a birthday today. New comment added. Gary Andrew Van Riper added a comment on his Profile. Gary Andrew Van Riper updated his profile. View. Gary Andrew Van Riper posted a message. New comment added. Gary Andrew Van Riper posted a message. Gary Andrew Van Riper added a comment on Nancy L. Tewes Macauley's Profile. Gary Andrew Van Riper posted a message on Richard W. (Rick) Myron's Profile. Gary Andrew Van Riper added a photo to his profile gallery.